It’s nearly impossible to imagine a guitarist who doesn’t own a pedal or two, (beginners excluded), and it’s a fact that most people pay more attention when buying instruments and amps, so the real question is – just how important are tone altering effect pedals? Surely enough, most modern amps feature built-in stompboxes, but you can’t compensate for the true, distinctive sound only a dist pedal can give you with buying more expensive gear. There’s a plethora of effect pedals on the market, and finding the best one for the buck can be extremely hard. That’s why we’re here with the reviews of the best distortion pedal models – we’ve tested out a total of 20 pedals, some which cost quite a lot, some which are a bargain, and we hope you’ll like them as much as we did. A great budget option from a well-known manufacturer in the space, the Boss DS-1 gives you more than you expect from the price tag. 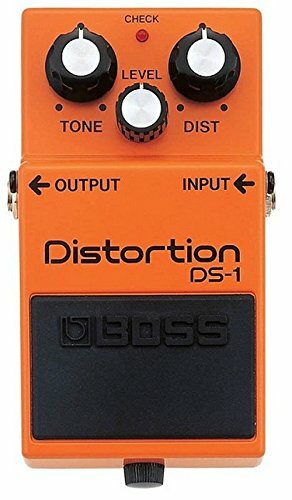 Let’s open up our review of the cheapest high-value distortion pedals with Boss’ DS-1. Basically, this is an entry level effect pedal which boasts a moderately high distortion, it’s very plain, and most beginners would benefit from it. Starting with the basics, the DS-1 is, perhaps, one of the cheapest Boss pedals. This brand is known for manufacturing some of the greatest high-end pedals, and even though DS-1 can’t exactly compare to them, it does a major bang for the buck. 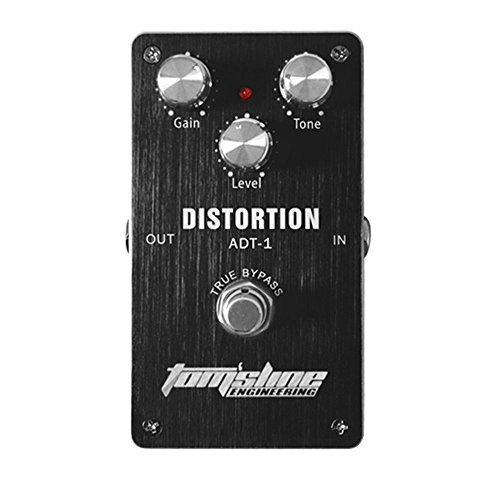 This distortion pedal belongs to the medium bracket of the “affordable” price point category. First of all, most people like the plainness of DS-1. 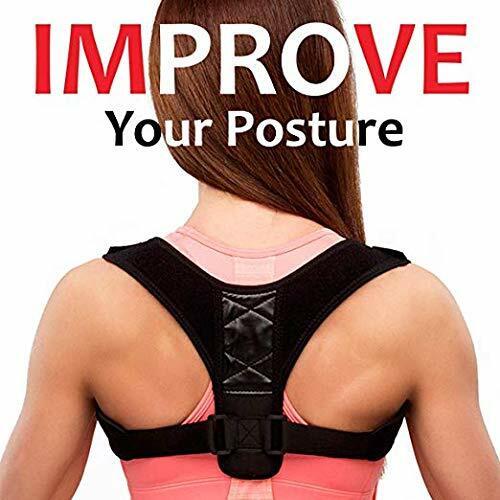 It features only three control settings which don’t provide too much versatility, but you’ll be able to find what you are looking for eventually. There’s more gain than actual “distortion” feel, although cranking the “dist” setting up will fuzz it up properly (we highly recommend that you don’t do that if you’re looking for accurate, balanced sound). The standard Boss design of the housing is what most people like about it – there are no unnecessary graphics, and the control settings are minimal as well. Even though this might not appeal to everyone, guitarists who are just starting out won’t have to trouble with learning how it operates. There’s just one thing about DS-1 that doesn’t quite add up though. Namely, the lows aren’t punchy and bassy enough for “stronger” music sub-genres. For instance, if you’re planning on playing in lower tunings (especially if you intend to play some of the more brutal metal styles), you might want to consider getting a compressor for the lows. Overall, Boss DS-1 is great for the money. Most budget dist pedals aren’t nearly as strong, and if we’re going to be honest here, entry-level effect pedals often don’t promise too much versatility to begin with. Some people say that this is "metal" exclusive, but we think it is a great budget option for anyone that is in need of a high-value option for their dist pedal. 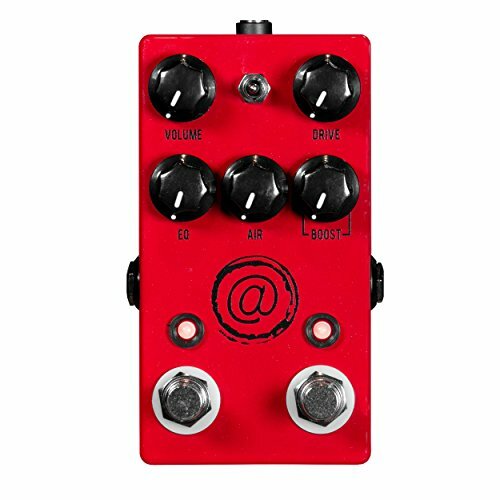 TC Electronic is a very reputable brand, and it’s actually quite a surprise that they’ve made such a quality dist pedal for people who’re low on budget. In a nutshell, this is not your average minimalist distortion pedal – it brims with quality all over, and we’re quite proud to have tested it. The “Dark Matter” surely does sound sinister, but the real surprise is that this pedal offers plenty of versatility. First of all, the “Dark Matter” comes with four control settings – bass, treble, level, and gain. You’ll benefit from absolute control over your gains, and this means that you’ll be able to use it for numerous music styles. 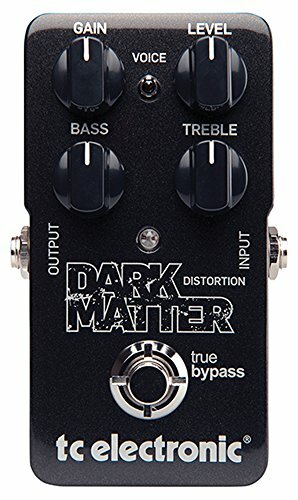 While Boss DS-1 didn’t feature a true bypass setting, the Dark Matter does – this feature overrides the primary signal if there’s any problem with it, so you could simply switch to your Dark Matter if the rest of the chain gets obstructed (or disrupted), preventing feedback and similar nuisances. What’s more, the voicing switch feature is an incredible addition to the already-great setup of this dist pedal. It shifts the bass response in a substantial way, allowing you to sacrifice a bit of mids and highs for the sake of brutal lows. The construction of this distortion pedal is quite sturdy, and it’s as lightweight as it is compact, making it an ideal pedal for virtually any kind of rig. Not everything is perfect about the Dark Matter, though. Firstly, the DC adapter is sold separately, so you’ll have to rely on batteries unless you have one or plan on buying one. This is not too much of a deal breaker though, as it couldn’t cost more than a few dozen bucks. The other thing people seem to mind is that the distortion of this pedal is quite sharp and edgy. Some people go as far as labelling Dark Matter pedal’s tonal quality as “metal exclusive”, but that’s not necessarily the case. You “could” technically get a full-metal sound easily with this distortion, but people who claim it’s only for metal obviously never figured out how to reap the benefits of versatility it offers. All things considered, the Dark Matter pedal is worth every single cent. You’ll have a real hard time finding a more versatile pedal, not to mention a model which comes outfitted with such high-quality features. Honorable mention in our budget category, the Behringer SF300 has great quality for the price tag. Definitely check them up if you are shopping around for your next distortion pedal. Next up is Behringer’s Super Fuzz SF300. Behringer boasts a versatile catalogue of premium-quality electronic tech, so we were all too thrilled to give this dist pedal a shot. Initially, it seemed like an ordinary effect pedal with a bit wider footstomp, but we knew there was more to it than just that. Although our expectations were high, the SF300 delivered. There are four control settings onboard – the level (refers to presence), treble, bass, and gain. Apart from that, there are three selectable modes – the fuzz 1 is crispy and it muddies up the tone by just a bit while the fuzz 2 resembles a solid overdrive with chirpy highs and cracking mids. “Boost”, on the other hand, is what makes this one of the best distortion pedals, as it sounds deep and pronounced all the way. The rugged construction is certainly a plus – even though this distortion pedal is a bit larger than average, it will not take up too much space in your rig. What’s more, the electronic switches are pretty durable as well and won’t wear off as quickly. We initially thought that Behringer’s Super Fuzz SF300 is a beginner’s dist pedal, but it’s actually great for more experienced players – the sound control you’ll get requires a certain degree of skill and knowledge if it’s to be used properly. Additionally, the overall tone of SF300 resembles that which Plexi amp drives used to provide. Since it boasts superb versatility, Super Fuzz SF300 can be used as a booster pedal if you already have a dist effect in your chain. As a primary dist pedal it promises a lot in terms of performance and sound quality regardless. Now, even though there’s a plethora of things you could like about this distortion pedal, there are also several downfalls which should be highlighted. First of all, the battery cover is very difficult to remove. Of course, if you’re a responsible veteran guitarist who’s equipped with the necessary tools at all times (screwdrivers most importantly), this shouldn’t be too much of a problem for you, but otherwise it’s quite a hassle. Secondly, people who don’t like how Plexi amp drive sounds might not be content with the sound quality of Behringer’s Super Fuzz SF300 – it’s peculiar, to say the very least, and it will definitely require some getting used to. Be it as it may, it’s a terrific pedal for the buck, and since you’re already searching for cheap dist effects, this one deserves some consideration. True bypass and three adjustable knobs make this a great starter option if you don't have the budget for our more expensive choices. Aroma is maybe an underdog brand when compared to Boss and TC electronic, but ADT-1 is more than capable of proving that the name builds itself, not the other way around. In essence, this is a basic distortion pedal with three control knobs and a true bypass – it excels in delivering rich sound and boasts a user-friendly feature outfit, although its simplicity is, perhaps, its biggest pro. First of all, the ADT-1 features a great distortion – it’s not as bluesy as ABS-1 or as heavy as AMD-1, so it’s safe to say that it’s well-balanced and quite versatile for that matter. It could be used in all sorts of music sub-genres, such as rock, pop, metal, or even jazz but if you have a touch for something darker and heavier, you should consider the AMD-1 edition. With a true bypass feature you’ll never have to worry about any potential problems in your signal chain – with as much as a push on this button you’ll be able to override the signal and switch it to ADT-1, excluding all other pedals from the bunch. Additionally, this feature minimizes the tone loss while giving you enhanced control over this pedal’s primary functions. This high-gain pedal features three adjustable knobs (which is why we consider it as “plain” dist pedal) – gain, tone, and level. Even though it’s not unprecedentedly versatile, its all-around performance could outshine most distortion pedals within the price range. The housing is made of aluminium alloy, which basically means that it’s as sturdy as it is durable. Overall, this is a great budget dist pedal for the money. The last budget distortion pedal in our review comes from NUX and bears the title of HG-6. This is, essentially, a great high-gain distortion pedal which comes at a shamefully low price, which is one of the prime reasons why we’ve saved it for the last. NUX is an underdog brand, but there are plenty of reasons why you should consider this effect pedal. First of all, it comes supplied with a full-analogue circuit with a 3-stage gain. That means that you’ll be able to customize the depth of your distortion in the range between “mild” to “brutal”. What’s more, the FET hardware further compliments the quality of sound, resembling that of a legitimate tube amp. There are four settings onboard – tone, scoop, gain, and level. 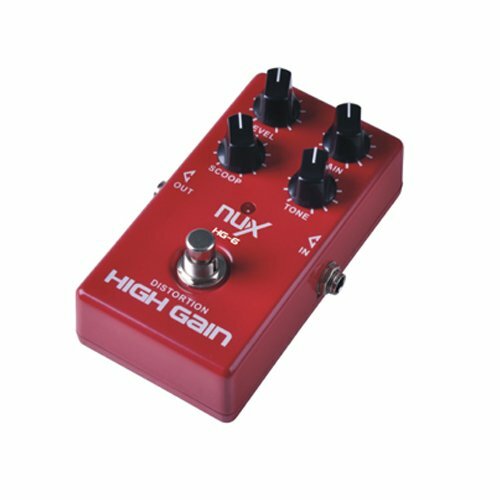 Considering this, NUX HG-6 is pretty versatile, making it great for numerous music genres and sub-genres, although the high-gain makes it suitable for more extreme playstyles. With the slim profile, this distortion pedal will take only so much of your rig’s space – this means that it will sit just perfectly next to your other effect pedals. Additionally, the overall construction of HG-6 is quite robust even though it’s lightweight. There’s a world of differences between a budget distortion pedal and a premium-quality one. The sheer difference in reliability is enough, but there are other things that set them apart, like sound quality, versatility, easiness of use, and other. What’s more, budget pedals are meant for beginners – guitarists who are just starting out can get entangled in confusion rather easily, so entry-level distortion pedals are often plain and supplied with a modest set of necessary features. This section will help you pick the best cheap distortion pedal for the buck. There’s cheap, and then there’s “cheap” by “cheap standards”. That means that there are distortion pedals that cost $10 and those models that cost approximately $25, and even though you think the price difference between them can be characterized as statistical error, it means a world. Namely, extremely cheap distortion pedals are often just a bunch of hardware pieces scraped together in a metal box – what you see is, more often than not, less than what you actually get. If you’re a complete beginner with absolutely zero experience with guitars and guitar accessories, you might feel like picking up the least expensive model sounds just right – that’s the least risky investment, right? Well, that virtually the best way to waste your money, regardless of how small the sum is. Paying a couple bucks extra will benefit will greatly benefit you, so consider this before you purchase your first budget distortion pedal. There’s a very special reason why you should pay close attention to the distortion level of your budget pedal. Namely, moderately priced and boutique level models are usually capable of providing you with a range of sounds – from bright fuzz to extreme, punchy distortions. The situation isn’t the same with low-end distortion pedals though. Basically, a cheap distortion pedal is usually meant for a singular purpose – “fuzz” pedals sound terrible when gain is cranked to the max, “overdrive” pedals are well balanced but should always have knobs rested at some 12 o’ clock (or in near vicinity), and so on. Pick your budget distortion pedal according to your playstyle – you won’t get too much versatility to play around with, so it’s better to know beforehand what these pedals can offer you than try to achieve something that wasn’t supposed to be in the first place. Moderately priced and high-end distortion pedals are (almost) always durable – that’s why the question of their sturdiness seldom pops up in reviews, although this “quality” should be tested out under a magnifying glass when it comes to budget level distortion pedals. If we are to take a low-end and a high-end distortion pedal (that look alike) and lay them next to each other, there would be no significant differences. For instance, Boss DS-1 and Zakk Wylde’s Berzerker feature a very similar design, as they’re both plain distortion pedals. Both of them are quite robust, but that wouldn’t be the same if we compared the Berzerker to, let’s say, Kokko’s Mini distortion pedal. The latter features an aluminium housing, but it would easily break if you stomp on it too hard while the Berzerker would be able to shrug off the “pain” with ease. If there’s an unwritten rule about budget-level distortion pedals, it’s that they (almost) always feature a petite, compact design. Most cheap distortion pedals are built in such a way so that they could complement a rig of a beginner guitarist, not to mention that these pedals are almost exclusively plain in nature. When you’re looking for a quality cheap dist pedal, you can narrow down the object of your search if you skip the bulky, oversized models, giving exception to but a few pedals which are widely known as valuable (for example, the Dark Matter is a bit larger than your average cheap dist pedal, but its value is remarkable). Kirk Hammet's distortion pedal tops our list of the best high-end pedals. It has through-the-roof amp-like behavior and a unique graphic design. 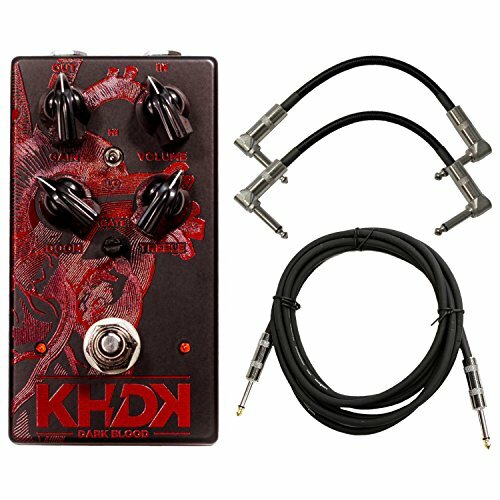 Kirk Hammet’s signature “Dark Blood” distortion pedal is the first high-end dist pedal in or review. It’s incredibly strong and boasts amp-like gain, but there’s a whole world of things that make it different from the others high-end distortion pedal models. First of all, you’ll notice that “Dark Blood” looks very unique and peculiar. It looks as if real blood was splattered across a dark housing, and it features the sinister “Doom” mode, apart from the other control options. If you have a keen eye for aesthetics, this means that you are going to absolutely love this distortion pedal, but you should note that these graphics make the control knob markings a bit less visible. Secondly, the gain of this dist pedal is absolutely through the roof. As Kirk Hammett stated “I Plug it in when I want an over-the-top sound that dominates everything. It’s a tornado.”. That basically means that Dark Blood goes above the rest of the volume pedals in the chain, so proper positioning is mandatory. Moreover, metalheads who used this pedal report that it features a pure amp-like sound, which means that it could easily be your primary (and only) distortion effect in the chain. That overrules the need for versatility, even though Dark Blood has it in abundance – the “doom” function governs the pre-distortion gain, and you’ll be able to use the other three control knobs to tune your sound to your liking. Since it’s a high-end distortion pedal, there’s no need to explain why it’s considered as highly valuable despite its expensiveness. The only real problem you could have with Dark Blood is the muddy graphic which somewhat overlaps the control knob markings, but once you get used to it, you could easily say that this is a perfect, if not the best high-end distortion pedal on the market. A more basic-looking design masks the incredible versatility of the AT+. You can use it for rock, metal, or punk and it won't let you down. JHS is not as famous as Boss, Zoom, TC Electronic or similar brands, but there’s a very special reason why we’re recommending you this distortion effect pedal. It looks pretty basic, but it houses five control knobs, two foot-switchable boost effects, three-way wattage toggle, and numerous other neat features. For starters, Andy Timmons used this exact pedal model to get his sweet & sour tone. The clearly British sound this pedal provides is suitable for all kinds of genres, and if it weren’t for AT+’s versatility, you’d say it would be perfect for every sort of rock, metal, and punk. Bluesy and jazz-like melodies can also be nailed down if you leave out the boost and dist knobs though. Unlike some high-end distortion pedals, this one aims to mimic the sound real tube amps provide – that’s why you’ll get to use the 3-way headroom switch and select between 25, 50, and 100-watt amp performance types. The strongest option (100 watts) provides impeccable sound clarity and total headroom) while 50-watt position provides you with some compression. The least powerful (25-watt) option almost completely compresses and drives the sound, providing pinpoint sound accuracy and a whole new level of tone clarity. Essentially, this pedal is like an amplification device packed in a (rather bulky) box. It’s incredibly versatile, and you get to choose how powerful you want it to sound. Surely enough, it costs a bit more than your average dist pedal, but it does a good bang for the buck. Lastly, there’s an independent foot-switchable boost onboard. Regardless of how much you muddy up your sound, there will be times when you’ll need even more power – the independent boost allows you to squeeze those last drips of juices from your AT+ and slam down those solo sections unlike ever before. We liked the Eclipse over the Riot and Shiba models due to the increased versatility while keeping up-to-date with their suite of features. If you can afford the price tag, you won't be disappointed. Suhr’s “Riot” and “Shiba” earned a bit more fame than Eclipse distortion pedal, but the reason why we’ve decided to go with this particular model is plain and simple – the “Eclipse” offers a bit more versatility than its counterparts, it’s easier to find the exact tone you need, and it offers the same benefits they do, even more if you know how to utilize its features to their maximum. In a nutshell, the Eclipse offers two exceptionally capable channels with authentic distortion you’d get from a quality amp, it comes outfitted with an immensely powerful EQ, a single tap on it will break the gain hell loose, and the housing is pretty sturdy and robust. Let’s discuss this in more detail, shall we? The sound quality of this distortion pedal knows no bounds – you’ll get full-bodied cleans, any solo played while it’s on will break a window (or two), and the rhythm tones will sound extremely punchy and crispy. Even though it’s pretty versatile, this pedal isn’t too well-rounded though. Namely, you’ll see plenty of little buttons and knobs on it, but divide them by two and you’ll get the real picture. Each set of controllable settings (knobs) governs one channel – basically this pedal is comprised of “gain”, “level” and 3 EQ knobs which are all mirrored onto the opposite end of the casing. 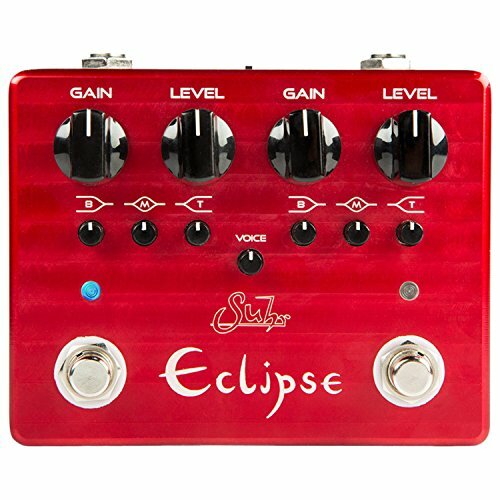 As it’s common with boutique level distortion pedals, Suhr’s Eclipse features a true bypass option – since it’s already quite powerful and versatile, switching to it (as a standalone pedal) when your chain gets unstable will get you out of a tough spot with a single press of a button. There are only two things we didn’t particularly like about it. First, the channels can’t be used simultaneously (in parallel or stacked). That’s not such a big deal usually, but it’s a shame nevertheless. Secondly, the voicing isn’t exemplary, but it’s ok overall. All things considered, Suhr’s Eclipse is a wonderful, sturdy, and powerful distortion pedal. It’s more capable than most similarly priced pedals, and deserves some consideration if you’re looking for a valuable dist pedal. A ton of configuration options, high-quality components, and used by musicians all over the globe, the SD Palladium stole the show in our reviews. 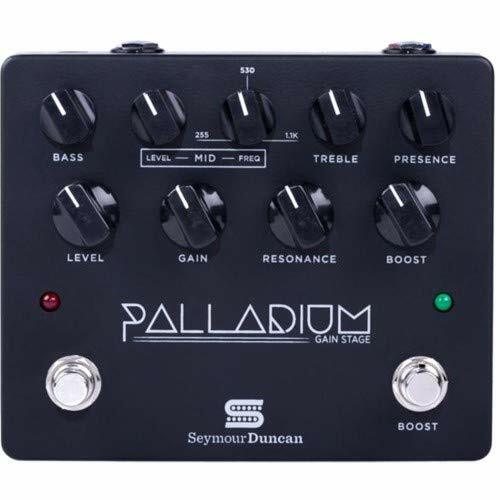 We’ve saved the best for the last – Seymour Duncan’s Palladium gain stage is a spaceship of distortion. It comes in two color variants (black and white) and sports a classy, elegant design, but aesthetics are the last field in which this exquisite distortion pedal excels. First of all, there are three gain stages for you to choose from – this feature alone provides enough versatility for you to use the Gain Stage in virtually any music genre. Apart from that, there’s a total of ten control knobs – bass, level, mid, frequency, treble, presence, level, gain, resonance, and boost for you to choose from. It’s safe to say that this distortion pedal has it all – it packs enough power to burn through a gig of any size, its unparalleled versatility redefines the word “versatility”, and it comes outfitted with a bunch of user-friendly features which make it ideal for guitars of all levels. You’ll need some time to get accustomed to (and play around with) them, but there’s no end to the things you could do with this beauty. The only bad thing about this pedal is that it costs an arm and a leg. Even though we are talking about high-end distortion pedals, this one’s pretty expensive, even by boutique level standards. Nevertheless, it holds a superb value for the cash. Since you’re already willing to pay top dollar for your high-end distortion pedal, it’s only normal that you should get a model that promises a higher level of versatility since it’s going to be a “keeper”. An average dist pedal could be versatile if it could pass the following test – does it have several control knobs? Does it have at least one outstanding feature? If at least one of these statements is correct, your pedal is versatile. The story is a bit different when high-end distortion pedals come into play. Namely, a high-end pedal is versatile if it could fit in any rig, any playing style, and any music genre. That means that choosing a complex, multi-knob, multi-channel, amp-like-sounding pedal is what you want to do here. A high-end distortion pedal needs to dominate any medium and low-end model. The first difference you’ll hear when you compare the sound of a boutique dist to any lower-priced pedal is that you’d feel in your very bones, if not the soul. High-end pedals burn their way through once the effects kick in and the knobs are cranked up. The amount of power of a distortion pedal is measured through its gain potential and sound customization, so don’t settle for less than brilliant. Before a pedal can earn the title of a “high-end model”, it needs to be different from other pedals, even by the length of a hair. You’ll encounter numerous unique, exquisite models in your search, and you should know that “exceptional features” are the key element of every top-shelf pedal. For instance, Kirk Hammet’s Dark Blood features the “doom” knob which governs the pre-distortion gain, Suhr’s Eclipse features 2-channel distortion and an independent gain boost while Seymour Duncan’s Palladium gain stage comes outfitted with ten sound control knobs. With some of the muddiest distortion effects available, the MT-2 is a great choice for the metal enthusiast. 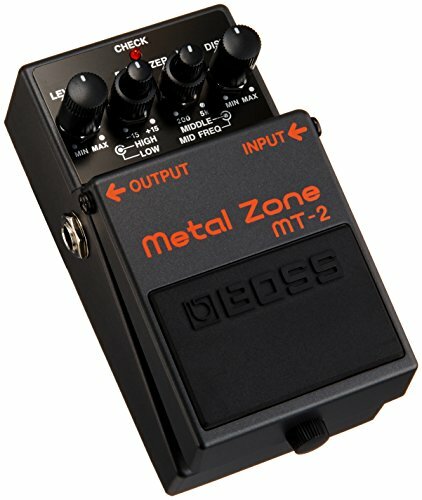 There’s no way of putting it – Boss intended the MT-2 Metal zone for metal musicians exclusively. This pedal is somewhat versatile, but it features some of the muddiest distortion effects known to man – regardless of what metal you intend to play, this pedal will follow you through. You’ll see only four control knobs (which is fairly common with Boss pedals), but you’ll be amazed at the level of control you’ll get once you started tweaking them around. The “level” is your primary “volume” knob, the EQ dabbles with low and high frequencies while the distortion is your “gain”. Though plain, this pedal can burn a hole through the roof, even when the “dist” is on 12 o’clock! People tend to really like how this pedal offers accuracy and precision over the tone you’re searching for. Even though it’s not extremely versatile, the simplified search for your sound makes Metal Zone MT-2 absolutely perfect for young metalheads. What’s more, it’s great that the level and distortion are completely separate – you can balance the edge depending on the situation more easily this way. Anyhow, there are a few things we thought could be improved about the MT-2. First of all, when both level and dist knobs are cranked up, there’s bound to be some feedback and static interference heading your way. That being said, it’s easy to make this mistake, but now that you’re aware of it, this should no longer be considered as a flaw. Secondly, the power indicator is faulty in some units. There are people who report it staying on even after you turn the pedal off – this issue tends to occur when you’re changing batteries (or when batteries are about to run out). The cheapest metal distortion pedal to make our list, the HM3000 is great if you are just starting out or don't have a large budget to devote do your next dist pedal. 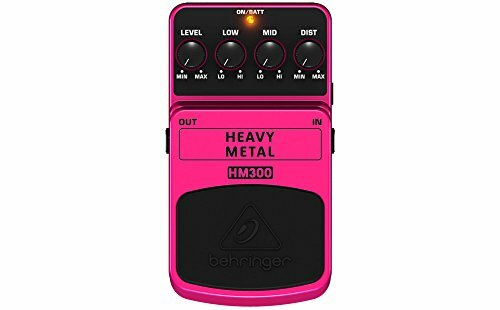 Behringer’s Heavy metal HM3000 is one of the cheapest pedals you could get as a metal enthusiast. Of course, most people are automatically dissuaded by its pink color, but there are plenty of reasons why you shouldn’t be. First of all, the HM3000 packs a strong punch for a distortion pedal in the budget section. The control knob outlay is very similar to that Boss Metal Zone MT-2 comes outfitted with, so you’ll get to use “level”, “low”, “mid”, and “dist” functions while searching for your tone. There’s a LED power indicator which will tell you when the pedal is on and off – even though this is a very plain feature, it’s quite necessary to have it, and certain metal pedals don’t. Lastly, the HM3000 is ideal for all kinds of metal, hard rock, and similar “stronger” music sub genres. It’s not exactly versatile as it’s cheap and intended for a singular purpose, but you don’t have to fret too much about it if you don’t want to switch between genres too often. As we’ve already mentioned, the only real problem about this pedal is that it comes in pink color exclusively, and you won’t have to think too much about why this color is not so metal. An authentic experience with a ton of versatility makes the Blackstar HT-Dist a favorite among the thousands of metal players that use it every day. 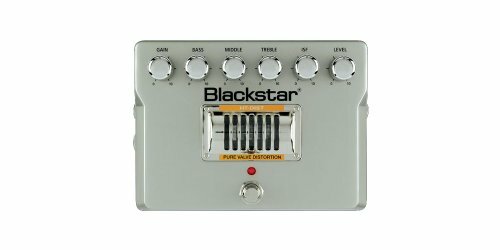 Blackstar’s HT-Dist pedal is often considered as the best distortion pedal in the metal world. It simply has everything you need – plenty of power, versatility, controls, and a beautiful casing. The real reason why metalheads like this distortion pedal so much is because it offers the authentic, exquisite distortion without sacrificing sound clarity. Of course, the control knobs are aplenty, and you’ll be able to muddy up your sound if you wish to. Whoever is searching for a huge-gain, highly versatile metal distortion should look no further – the control knobs are comprised of gain, bass, middle, treble, ISF, and level which should be enough for you to find a vast array of sounds applicable across every single metal sub-genre. The casing is somewhat bulky, but such is the case with valve distortion pedals. Lastly, this is an expensive metal pedal, so if you’re looking for a cheaper solution, Behringer’s HM3000 could be better for you. Metal is not just noise, and picking a metal distortion pedal isn’t all about gains and distortion (even though they comprise the majority of important factors). Let’s see how you should pick your best distortion pedal for metal. Since metal is the loudest, noisiest of all music genres, it’s only normal that you’ll need to pay attention to distortion the most. High-gain dist pedals are pretty easy to find, but some brands like Blackstar, Boss, and Behringer make models that provide the much needed punch for more damage. Surprisingly enough, distortion pedals for metal are spread throughout all price point categories. For instance, Behringer’s HM300 is as cheap as can be while Blackstar’s HT-Dist is almost a boutique-level distortion pedal. Don’t pay too much attention to the price, though, as a good distortion for metal is usually all you need. Metal musicians usually have rigs laden with numerous pedals and other guitar accessories. That’s the reason why a metal pedal simply needs to have a bypass feature – the more pedals are linked to the chain, the higher are the chances of something going awry. You could negate the risk of such a thing with the “bypass” feature. 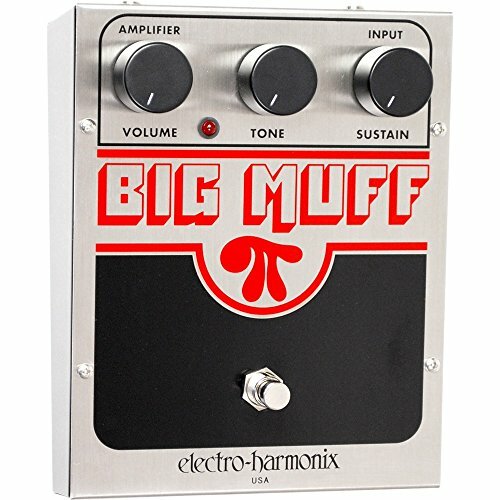 A reissue of the Big Muff from the 70s, the Electro Harmonix Big Muff is stronger and more versatile than the original. There are volumes we could say about Electro Harmonix Big Muff, but it would suffice to note that some of the best guitarists started out with it like Santana, Jimi Hendrix, and of course, David Gilmour. This is a reissue of the original Big Muff which came out in the ‘70s – it packs a stronger punch and it’s more versatile overall. Basically, if you’re looking to get a sort of distortion that Pink Floyd’s Gilmour uses, the Big Muff Pi is the answer – of course, the specific tone he got is the end result of numerous quality effect pedals, but he got the crunch from the Big Muff. So in essence, this distortion pedal gives off an old-school, even a bit nostalgic fuzz. The gain level is moderate, to say the least, and the control settings won’t help you change that. Namely, the control settings govern the “volume” (signal strength), “sustain”, and “tone” control (the latter refers to the color of the tone). That being said, the Big Muff Pi is absolutely ideal for people who are locking for rock-style medium-gain distortion. Alternatively, you could use the Big Muff as your tone color pedal and borrow the gains from a stronger one. If, on the other hand, you’re simply in need of a quality pedal and the Big Muff suits your liking (basically, if you don’t want David Gilmour’s sound), there’s plenty of versatility to tackle the challenge of finding your own unique tone. Even though there are only three control settings, the tone knob will allow you to tweak your initial sound a great deal. Sustain, on the other hand, can make virtually any guitar sound like a top-shelf Stratocaster. You’ll certainly like to hear that Big Muff’s Pi distortion doesn’t cost a fortune – namely, it’s one of the few dist pedals in our “signature” sub category that belongs to the medium bracket of the “moderately affordable” price point category. We, however, though that there are a couple of things that could’ve been improved a bit. For starters, this distortion pedal doesn’t feature any “gain” control. That means that it wouldn’t be particularly wise to use it as your primary dist pedal, as it won’t get your tone enough punch if not paired with additional volume effect pedals. Apart from that, the overall feel and sound of this dist pedal is plainly awesome. Most people advocate the statement that Big Muff’s Pi dist pedal is a “must have” for any guitarist, and we completely agree and wholeheartedly recommend it to any player looking for a good dist for the buck. Focusing on flanger, phaser, and of course distortion, all modeled after the notable sounds from EVH's historic music career. Eddie Van Halen has certainly made quite an impact on guitarists young and old. A musician of his class is bound to have a few tricks up his sleeve (which made him so popular), and we uncovered one – the MXR’s EVH 5150 dist pedal. In essence, this is an “overdrive” pedal which features elements of flanger, phaser, and distortion, all of which can be heard throughout Eddie’s numerous songs, albums and live performances. Van Halen’s “real” sound, however, is pretty hard to acquire, as he uses premium top-shelf gear (Marshall super Lead and EVH amps play key roles, but both cost an arm and a leg). Even though his exquisite sound can’t be matched to the very little detail, this pedal offers a way by which you’ll be able to get really close. This pedal is extremely versatile, it’s large, and comes outfitted with numerous controllable sound settings you’ll use to find your own sound. What’s best about this dist pedal is that it comes outfitted with five control settings – there’s output which resembles the conventional “level” knob, the bass governs the lows, mid and treble are self explanatory while the gain allows you to pick the level of your pedal’s strength. On top of that, there’s a “boost” button which sets the hell loose if you’re looking for a more extreme touch of evil. Much to our surprise, we figured that this dist pedal is incredibly noisy, but if you use the “gate” function you’ll be able to cut back on feedback and external crackling, giving you the option to play both raw and accurately (depending on your playstyle). Certain things about it aren’t so cool, though. 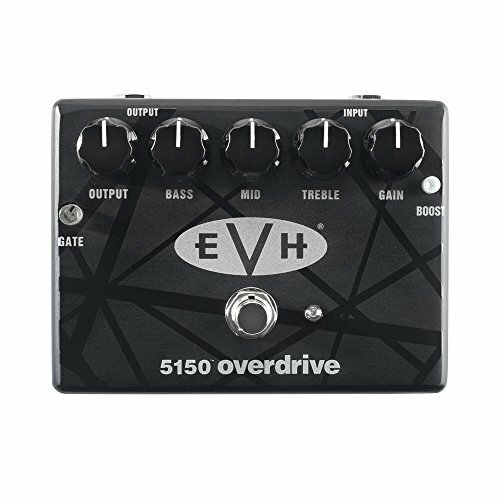 Namely, EVH 5150 distortion pedal doesn’t come cheap. It belongs to the bottom bracket of the high-end price point category and it’s safe to say that most guitarists wouldn’t feel too good about paying so much for a pedal. Regardless, it’s so versatile that it could take up half of your rig (and replace it), so at least its value is incredibly high. Lastly, beginner musicians might need some time to get accustomed to the abundant control layout – there’s just so many things you could do with this pedal, and guitarists-in-the-making might get lost and confused easily. Zak Wylde earned his fame in BLS (Black Label Society) and while playing with the infamous Ozzy Osbourne. Young guitarists have often dreamed of having his guitar playing skills while others aspired to find out how he sounds so good, ourselves included. Even though he’s switching guitars, amps, and pedals every once in a while, there’s a neat little pedal that could help you get really close to Wylde’s aggressive sound – theMXR Berzerker. Essentially, this is a plain pedal with a humble set of features, but it boasts a huge value for the buck due to its easiness of use, sufficient versatility, exceptional gain, and distinctive sound. Let’s discuss its benefits in more detail. First of all, the sheer concept of MXR ZW44 is oriented around user-friendly features – that makes it absolutely great for both beginner and advanced level guitarists. There are only three control settings (output, tone, and gain) and a hardwire bypass which lets you shut off the rest of the chain if any problems occur. Secondly, let’s talk about MXR ZW44’s “sufficient versatility”. Generally, it’s not as versatile as some models we’ve reviewed (especially if we compare it to Van Halen’s signature EWH 5150, which is odd since they both come from the same brand), but that doesn’t mean that you won’t be able to tweak with the tone at all. Ideally, you’ll be able to acquire the same sound as Zakk Wylde, but the range of genres it could be used in varies from mellow blues to the heaviest of metals. In regard to the high gain we’ve mentioned, MXR ZW44 can split atoms with its strength if you crank up the gain knob all the way. That, however, would also require a compressor pedal if you don’t want static and buzzing to obstruct your tone. Lastly, this distortion pedal doesn’t cost too much at all. Surely enough, it doesn’t come cheap, but it’s priced fairly and holds a great value. We didn’t like a couple of things about it, though, but these are not deal breakers, rather small nuisances that got in our way of proclaiming the MXR ZW44 as the “best signature distortion pedal”. Namely, you’ll either love the MXR ZW44 or you’ll hate it. It’s sound is so exquisite that it will appear as if it’s been what you were always searching for while on the other hand, you might have some troubles adapting it into your rig. In essence, Zakk Wylde’s Berzerker MXR ZW44 is not for those faint of heart – it can mellow down your solo or tear down the roof in your leads if you know how to use it properly. Anyhow, it’s not overly expensive and should at least be considered if you’re looking for a high value distortion pedal. The last signature distortion pedal is Dunlop’s DD11 Dime Distortion. Dimebag Darell was one of the most influential metal guitarists ever, and it’s safe to say that every little metalhead dreamed about rocking the stage like Dime used to do – if that’s the case with you, then MXR DD11 is what you need! One of the most peculiar things about Dimebag’s sound is that he relied on Crybaby wah more than on his dist. What’s more, his playing style required some heavy artillery in terms of amps and guitars, so getting the exact same sound like him might prove to be a bit difficult, but not impossible. This distortion pedal comes with a well balanced 3-band equalizer, five control settings, and a scoop switch that can be used to cut down mids a bit (if they’re overly pronounced). As far as versatility is in question, you should have no worries whatsoever. Now, if you are a real fan of Pantera, you probably know that Dime’s distortion wasn’t too punchy – it was tight and strong, but it was also clear, which is why his solos sounded so good. If need be, you can crank the “gain” up and adapt your sound to suit more extreme music genres, but make sure to leave out the “scoop” switch because you’ll need the mids to compensate for strong lows. Basically, getting the real Dimebag’s sound would cost you several thousands to say the least – the amps and guitars he used don’t come cheap. That’s why MXR DD11 is a cheaper alternative, although it’s not exactly a bargain either – it belongs to the medium bracket of the “medium” price point category. 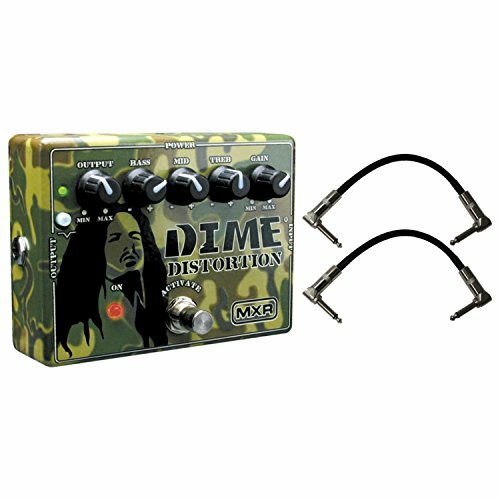 In general, this is a tribute distortion pedal rather than an actual “signature” model, but it will be able to get you the authentic Dime sound if you know how to use it properly. There are just a few things you need to look out for. First of all, there are plenty of buttons and controllable settings onboard – beginners should consider other, less complex models (like Zakk Wylde’s Berzerker, for example). What’s more, there’s no true bypass onboard, and the pedal itself is quite bulky – these are not deal breakers, though, as Dime’s DD11 offers enough versatility to compensate for the aforementioned hiccups. Signature distortion pedals are meant for people who are looking for a specific sound – people who are into a specific band (or a performer) and who want to sound exactly alike. Getting the sound of your favourite guitarist is almost impossible without their exact gear (amps and accessories), but the pedal they’re using will get you real close. In this section, we’ll guide you through all the details you need to know about picking the best signature distortion pedal – some models are more versatile, others are supposed to give you the least amount of versatility but compensate for it with the ability to accurately replicate the sound of the guitarist in question. We’ll discuss the pros and cons of owning this kind of dist pedal. Generally, signature pedals are good if you know what you’re looking for. For instance, if your favourite band is Pink Floyd and you want to sound like Gilmour, getting Electro Harmonix Big Muff Pi will help you get there. These pedals are often built to complement the sounds famous musicians got through amps and other guitar accessories, so they’re like “shortcuts” to acquiring the sound of your favourite musicians. You should expect to sound similar (if not exactly alike), but that doesn’t mean that signature pedals are useless in other spheres – a good distortion is a good distortion, and veterans have had their say about which models they prefer over others. There’s a reason why professional guitarists use these distortion pedals. How important is the level of versatility of my signature pedal? In essence, a signature pedal can be versatile (Dimebag’s DD11), or downright plain (Zakk Wylde’s Berzerker) – both types are good, so versatility isn’t that much of an issue. Most guitarists spend hours and days searching for that specific tone and color, and the entire process is shortened once you start using a signature pedal – this especially applies if the signature pedal is not your primary effect pedal (if you are using it for gain or color). How well do signature dist pedals complement the rest of the chain? That depends on the model. Signature pedals are supposed to be used with specific amps and other guitar accessories, so you should pay even more attention at how your chain is going to respond to something so “specific”. So what does that mean? We imply that (the majority of) signature pedals are a bit extreme in this way or that – since we’re talking about distortion pedals, signature models of this kind are usually laden with ultra high gain, so your chain might become unstable if you don’t outfit it with a compressor at the very least. Luckily, most distortion pedals feature true bypass – that means that you’ll be able to get the signal past all the other connectors and simply use your distortion pedal standalone. As you can see, finding the best distortion pedal is not as easy as it seems. There are all kinds of brands that make all sorts of distortions, overdrives, and fuzz pedals, so sifting through the market can be extremely time-consuming. We hope that you’ve liked our selection of top cheap, high-end, metal, and signature distortion pedals, and wish you luck in finding what you were looking for!